Baby Shamar was born in the Barbados just a few days shy of Christmas, on December 23, 2007. His parents Virginia and Michael were thrilled with their new bundle of joy and thought he was just the most precious and perfect little gift of their holiday season. As Shamar continued to grow, his parents began to notice that he did not react to sound. Concerned, they took him to their local hospital for tests and they discovered that Shamar was partially deaf. He was given hearing aids which soon proved ineffective. Virginia and Michael began to explore other options. Research led them to cochlear implants. A cochlear implant is a small, complex, electronic device that can help to provide a sense of sound to a person who is profoundly deaf. Surgery is required in order to implant the device. Testing for cochlear implants was not available in Barbados so the family travelled to Miami to seek help. It was confirmed that Shamar was a good candidate for this surgery but the procedure would cost close to $50,000 US. Heartbroken, the family knew that they could not afford this. They were devastated knowing that a procedure was available but because of lack of funds, their son may never experience the sense of hearing. They turned to family and friends for support and thankfully, a relative from Canada expressed hope. She told the family of Herbie Fund at The Hospital for Sick Children (SickKids) in Toronto. 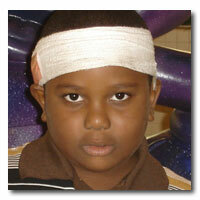 Shamar was accepted into Herbie Fund and scheduled for surgery in March 2007. He and his mother travelled to Toronto for the procedure and it was a success. Days after the surgery, Shamar’s device was activated. Virginia remembers Shamar being afraid at first but he soon became accustomed to sound and developed a love for the sound of sirens. Virginia and Shamar travelled back to Barbados and worked with local doctors on his communication skills. In early 2009, Shamar developed a slight complication, a keloid which is a layer of skin developed near his hearing device. The device became very uncomfortable to wear, and as a result, an appointment was booked a SickKids for its removal. Today, Shamar is just like any five-year-old boy. He loves the outdoors and computer games. He also loves coming to SickKids. He is always bewildered by the Atrium and its sights and sounds. When his mother watches him in the Atrium, it brings tears to her eyes. She recalls what life was like before Shamar could hear and thinks about how different his life would be without the cochlear implant.